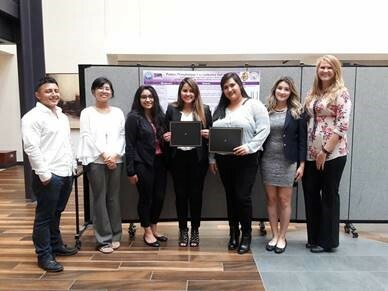 Two Dodge City Community College students, Carmen Del Real and Vanessa Hernandez, attended this summer’s Research Immersion: Pathways to STEM (RiPS) camp at Kansas State University in Manhattan, Kansas. The 8-week camp provides professional preparation for students who are are underrepresented in the Science, Technology, Engineering, and Mathematics fields. Both students were able to complete a research project related to their field of study and attend seminars. They were also engaged in guided social activities and were encouraged to network among their peers. “Those students applying to any summer program will mostly likely live with other summer research students from other research programs available within the university. I did, and it made my experience much better simply because these students were from different places across the United States including Puerto Rico. It was so much fun sharing the summer with so many unique personalities knowing that we were there for one reason, research,” said Del Real. “I would encourage anyone who is going into a S.T.E.M. career pathway to apply and participate in this program because it helps you get ready for your future,” said Hernandez. The students will both continue their education at KSU. Hernandez plans to pursue a career in dentistry while Del Real plans to become a surgeon.